As one of OOM Creative’s design services we add value to client data by translating large and complex datasets into interactive and informative visualisations. In this project we worked with ARUP to translate email, file and project billable hours into an interactive presentation entitled - The Secret Live of Projects. 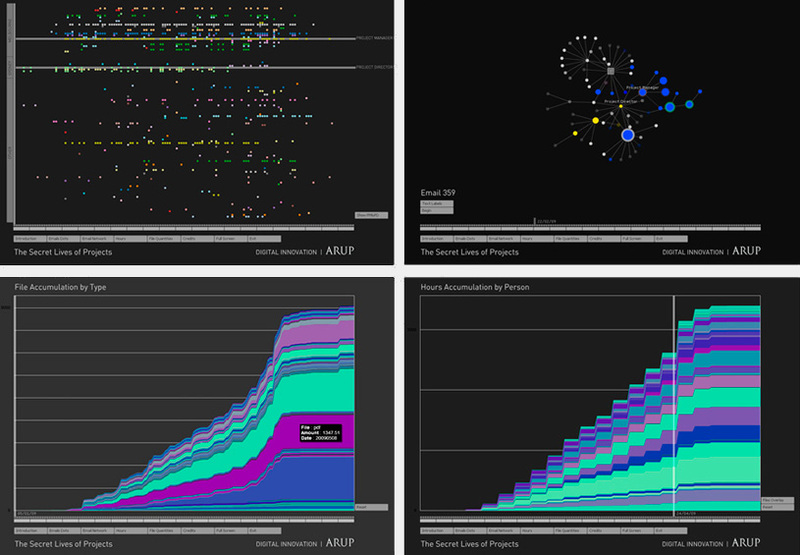 The project illustrates the relationships between human and digital activity by visualising the digital shadow (files, emails etc) of a project as it unfolds over time. who is sending and receiving emails, through the pulsing and decay of the nodes, and if not part of the email conversation the node fades over time. Other visualisations in the presentation included the a matrix of email senders aligned to cost centres, and a stack visualisation of the 10000 files used in the project.